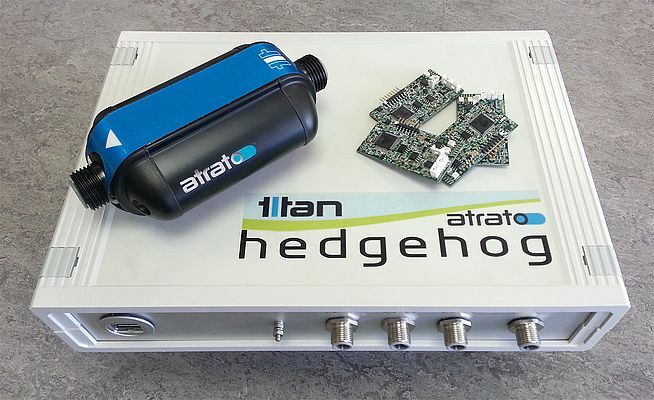 For OEM applications based upon the company's Atrato ultrasonic flow meter, Titan Enterprises announces the Hedgehog, an electronic development platform. The instrument has the capability of running up to 4 flow sensors simultaneously with real time analysis. The software interface permits a wide operating envelope allowing OEM products to be developed for 0.5 to 20mm pipes including in-line and clamp-on devices. The structure is such that software changes can be simply "dragged and dropped" into a box in the interface permitting remote on-board logic updating and system re-programming. A full array of inlets and outlets are available including both analogue and high speed logic signals for fast response system requirements. Smaller single channel versions `Hoglets` have also been produced to enable testing of single pre-production meters where space may be at a premium.